When Elisha woke up one morning surrounded by Aramean troops, he told his servant, “Don’t be afraid, those who are with us are more than those who are with them.” (2 Kings 6:16) Elisha said this because he knew something very few christians today understand: What is happening in the spiritual world affects what we experience in the physical world. Camp this year has had an incredible spiritual impact. Over 200 students experienced the presence of God this year. Many of them received Christ for the first time, we freed from sinful habits, found true forgiveness, or made commitments to serve Christ with the whole heart, soul, and mind. It was a time of amazing spiritual revival, but it didn’t come without a cost. I (as the conference speaker) was traveling to camp accompanied by the worship team (a group of students), loaded with all the sound equipment, instruments, and projection. The camp is about 8 hours to the south-west of Cayambe in a remote part of the coastal plain of Ecuador. Just as we were going to stop for lunch, a car appeared from nowhere and struck us broadside. 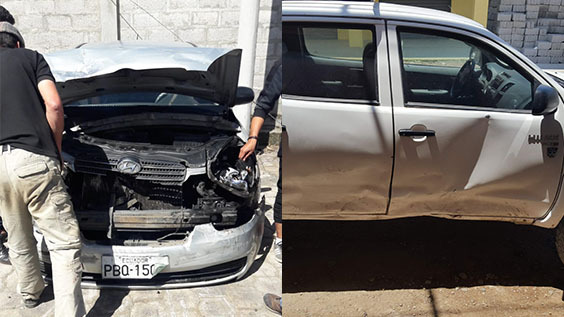 This would typically be a simple matter of calling the insurance company and working out the details, but this was rural Ecuador. The rules are different there. The one who struck us was the police chief’s best friend, was attended by his aunt in the clinic, and his uncle was his lawyer. Everything was suddenly our fault, and I was to be arrested and the truck impounded. That was the reality we could see. However, just as in the case of Elisha, there were spiritual forces at work that we couldn’t see. We could all feel a spiritual battle taking place. This was our enemy’s best attempt at thwarting the revival that would take place at camp that week. What we couldn’t see were all the people who were praying for us, but that’s when the tide began to turn. From the very moment of the accident, God gave me the self control to be calm, kind, and accommodating. The natural thing to do would have been to argue and defend our rights, but the fruit of the Spirit (peace, kindness, and self-control) took over. The young students who were with me watched as the tone began to change, as God began working to bring all the pieces together for a peaceful resolution. God did some amazing things that day. He softened the heart of the police chief to allow us to come to a peaceful arrangement. He helped Brenda make the deposits in the bank to pay for the repair of the other vehicle. He released the other driver from the clinic without injury. He guided the accident to keep our truck from flipping over and to keep it driveable. He provided each and every thing necessary to allow us to continue on to camp and have one of the most powerful weeks of ministry that I have ever been a part of. As we pulled into the camp at 9:00pm that night, 15 hours after we had begun our journey, one of the young ladies on the worship team said, “Today I learned more about what it means to live the Christian life than I have in the last 5 years put together.” Our God moves within moments of crisis in a way that we may never otherwise experience Him. Many of you who follow us on Facebook have already been asking how you can help with this accident. First, we want to say thank you for praying for our ministry in Ecuador. In moments of crisis like these, we know that we are surrounded by an army of prayer warriors who are constantly bringing us before the throne of the King. Your partnership through prayer for the ministry is essential. We highly recommend Crossworld’s online giving platform that makes partnering with our ministry very simple and gives you a lot of options. You can access Crossworld’s giving page directly at www.crossworld.org/give or by clicking the button below. Pray for our truck to get out of the repair shop as quickly as possible. It’s already been almost a month and we were told it will take two more weeks. Pray for our financial recovery after the accident with our truck. Pray for the Family Conference coming up October 25-28. South County Bible Church from St. Louis is hosting the conference. Pray for a time of renewal for the families in our church and for many new families to come to Christ. Pray for the Crossworld Ecuador field meetings October 11-13. We are hosting our director from the home office. Pray for the various Bible study groups in the church as they restart after the summer break. Pray they would be a source of spiritual depth and outreach. Pray for Daniel and Luke’s adjustment to the new school year.